This past Friday, I decided to try the Brooklyn Bridge Boot Camp in Central Park. One of my New Year’s resolutions (yes, I’m still keeping track of them) was not only to exercise, but also to lift weights alongside the cardio. The blend of calisthenics and running offered by boot camps seemed a perfect way to meet that goal. I chose the Brooklyn Bridge Boot Camp because of unsolicited recommendations from friends at work. I call them my health buddies—we chat about exercise techniques and food choices that turn our bodies into lean machines. Before jumping into the Brooklyn Bridge Boot Camp, I researched other boot camps in Manhattan and it was obvious that this was one of the cheaper ones. The first class is given at a discounted rate of $15, and even if I didn’t buy a package, I would only be paying $20 at most per class. This was definitely a deal, comparatively. In order to truly understand my point of view regarding this review, here is a bit of my exercise history: In short, I hate working out, but I believe it’s a necessary evil. And I hate running with a fiery passion. If I can make an excuse not to go to the gym, I will. I’m not in shape, but I’ve lost more than 30lbs this past year through a regimen of diet and exercise and I still have three pounds to go; the reaction I frequently receive to that is “Okay, Regina.” Hence the resolution to do more than just cardio—in 2012, I only ever used the elliptical, and while I lost weight, I wasn’t seeing the results I wanted. I decided upon the Central Park branch due to ease of access—I live on the Upper West Side, so it only takes me about 10 minutes to arrive at Ferrara Café, the meeting place at the edge of the Columbus Circle entrance to the Park. I chose the class at 6:30am, an ungodly hour, but the only one that would fit into my schedule. I was the first one of the attendees to arrive. Samantha, the instructor, asked if I had taken a class with their program before, and she asked about any injuries she should know of. I, in turn, asked her what to expect, and explained my only injury was a severe hatred of running. 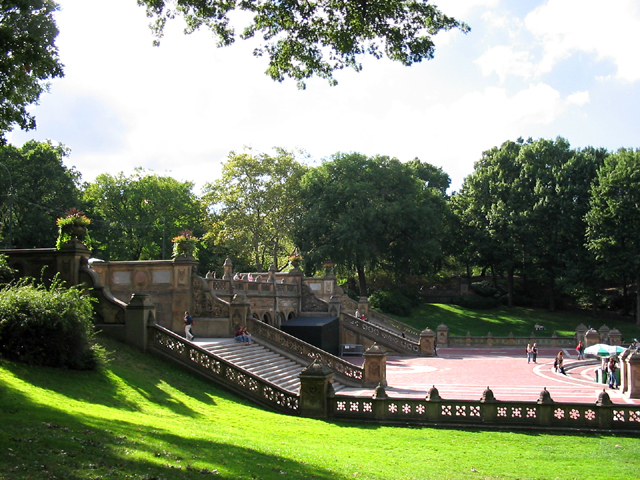 She explained that the class would cover only about two miles to the Bethesda Fountain and back, with periods of running limited to three to four minutes at a time. In between would be a series of exercises, and Samantha gave me two bands that would be needed for a few of them. The class is limited to 20, but only eight signed up for this one. There was only one other new girl in the class, but it was quickly evident that she was in far better shape than I. Samantha began us off with a warm up that including jumping jacks and derivations thereof. We moved onto wall squats broken apart by more “sumos,” a type of jumping jack that includes a plié in second position. From there, we began to run. I quickly found the end of the group and stayed there for the entire class; my goal was to be able to at least keep the others in sight so I knew where I was going (have I mentioned that I hate running?). As promised, the run was broken apart every three to four minutes by more exercises that quickly had the sweat flowing and the heart racing. The path the class took in Central Park was beautiful, especially as it is springtime and the Park is in full bloom. The class was not about stopping on the grass and doing sit-ups and push-ups. Instead, we used the landscape of the park as our equipment. If there was a low railing, we would do pushups there, or a low wall and we would do step ups. The steady row of lamp posts along the mall was used to alternate sprints and jogging (I, already exhausted by that point, switched between jogging and walking). The midway point was the Bethesda Fountain and the instructor led us down the steps through the adjacent portico. I, as any good Doctor Who fan would, found the strength in me to sprint out of the portico as fast as my legs would allow. I guess fear really is a good motivator. I certainly was not allowing any of those cherub Angels to steal my life force and send me back in time. Samantha had us do a series of exercises up the stairs to the side of the portico in the glorious daylight. I was unable to keep my eyes trained upon the Angel atop the fountain, but at least the Angels in the portico don’t like the light (okay, okay, I’ll stop with the Doctor Who references). She had us hop up each step, but my legs were so shaky that I was convinced if I did that I would tumble back down. Samantha explained that I could modify the exercise to run up the stairs instead. She also said to me that she wouldn’t ever give us a minute of down time, but I could take it if I wanted it. I was determined to continue through the class and, even if I had to walk, I always kept moving. The return from the Bethesda Fountain was much like it was on the way there—a bit of running broken apart by exercises. At the end, Samantha had the class stretch, but by that point I was so far behind the others that I missed half of it. Samantha is a good teacher. She isn’t one of those cliché boot camp instructors who yell at their students. She’s understanding, but pushes her students at all stages of the exercise journey, from the beginner to the well-trained veteran (of which there were a few). Many of the moves used by Samantha can also be found in the Seven-Minute Workout from the American College of Sports Medicine’s Health & Fitness Journal that’s been making the rounds in the news. The boot camp provides an intense full-body workout and while I can’t see results yet, I can certainly feel them; I was sore all weekend as a result. I’m looking forward to the next class. I want to keep this up and get stronger and faster in the process. Samantha, you’ve turned me into a believer. I’ll see you on Friday. use to fuel those organs.